Making : plans to get rid of stuff around the house. ebay, garage sale and possibly camberwell market, here i come! Drinking : too much coffee. need to stop with the coffee for awhile. Reading : eat, pray, love. about 50 pages in and it's not really doing it for me yet. i will persevere. Wanting : mae to get into some sort of sleeping routine again. the 8 or 9pm bedtime, one daytime nap and subsequent cranky baby for half the day really is not working. Looking: for a dvd recorder with a big hard drive at a reasonable price. Watching: mae stand by herself and clap. Playing : catch-up on everything these days. Sewing : vintage fabric oobees for christmas markets and two custom order quilts. Wishing : i had more time to sew vintage fabric oobees for christmas markets and two custom order quilts. Enjoying : the melbourne winter sun and a slightly less windy day. 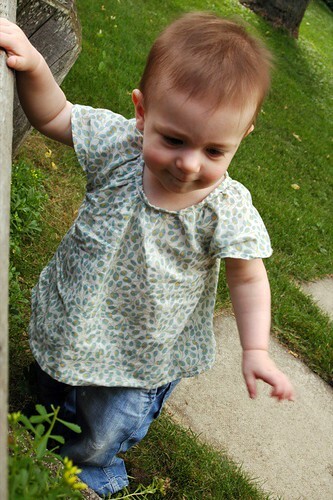 Liking : mae's love of exploring the backyard. means i can actually get some garden work done. Planning : to update this blog post with pattern details for the baby clothes as soon as i get my ottobre magazines back from a friend. Wondering : if mae is actually going to have a nap or if it's only quiet in there because she is busy throwing everything out of her cot. Hoping : that my sewing room magically tidies itself. and finishes a few of my ongoing projects. that would be sweet. Marveling : at the climbing ability of my one year old. turned around to find her IN her high chair and ON a kitchen chair so far this week. Needing : to shorten my list of things i want and need to do. Smelling : jasmin pinched from my neighbours yard. Wearing : clothes brought back from canada. Thinking : about making it to storytime at the kid's bookshop up the road. and about posting every day in september. meme nabbed from jhoanna, who got it from pip, and shortened considerably by yours truly. what a gorgeous photo of Mae! The book 'Save Our Sleep' by Tizzie Hall is great, and provides really good advice about helping get bubs back into routine. You might find at the library. also try saveoursleep.com.au & good luck! That book didn't do that much for me either. Mae's climbing sounds crazy, where do they learn that from? So far I've only found Matilda sitting in the dishwasher although she does love going up the stairs too. please read further "eat.pray.love" the first part was n't so convincing for me either, but the entire book - wow!!! I promise you , it gets better, much better!! I agree with Eva, took me a while to get into it but persevered as my sister recommended it and she doesn't do that a whole lot!! So pleased I stuck with it! Read it on holiday and finished it only a week in and was peeved off there wasn't more!! Aren't kids great! They are cranky and fussy and marvelous all in one big tumble of growing up! It might be hookey at the mo but a few years down the line from now u'll wish she took a nap at all!! I don't usually drop books half way through but 'eat, pray, love' just didn't do anything for me either. But, after the encouragment from Eva I might try again. Such a cutie! Great stories about the flight! stick with the book – but I must confess Italy was my favourite part. so so so much in here I can relate to, even if some of it is stretching my memory back to a year ago when C was one and we were preparing to embark on the extension..